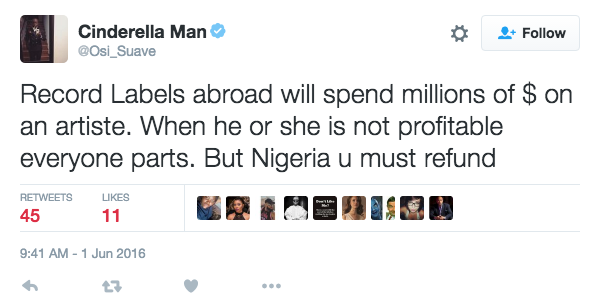 One of the viewpoints to first make the rounds on social media was that labels ‘in the abroad’ aren’t as hardnosed as Nigerian ones. They, allegedly, invest millions in the artist and if the artist doesn’t make it, everyone just parts ways. It’s a slightly outside way of looking at things. Yes, it’s a risk the labels are taking and if they’re not happy at the end of your contract, everyone parts ways happily (see, for example Skales and his former label, EME). However, no “abroadian” artist is going to simply up and try to jump ship. You either run out your contract, try to get the label to release you, or ask the court to tear the contract up. It’s a very naïve or poorly advised artist that declares a unilateral end to a contract that hasn’t yet expired. Contracts are the lifeblood of commerce. If people were able to make commitments to others and fail to honour them without any consequences, business/trade would be in tatters. For this reason, all over the [free] world, Courts are very reluctant to end or amend contracts that have been freely entered into. Those Unbelievable Clauses? It’s the economics, St#$@*! Following the ‘arrest’ and questioning of one artist and his manager, snippets of the artist’s recording contract were released and many commentators were shocked at the terms. The most fantastic of the terms appeared to be the £10m release/buy-out clause (riddle: when is a label like a Premier League club?) and the assignment to the label of the artist’s copyright in compositions that existed prior to his joining the label. The immediate assumption was that the artist signed the contract without seeking legal advice or, in the alternative, that he had a bad lawyer. It’s an assumption that misunderstands the dynamics of the Nigerian music industry, as the thinking behind it is that an artist can get a label to significantly change the terms of its contract. There are indeed a few artists that can get their requests for changes agreed to, but most are either label owners or execs themselves. For artists on the up and come, there is very little leverage that can be applied on the label, so it’s usually a take-it-or-leave-it situation. The artist in question here had just been released by his former label, where he’d only been moderately successful and had this new label promising him a signature bonus, a brand new SUV and a flat in Lekki. How many artists in that situation would listen to the lawyer’s advice not to sign? I’m speaking from personal experience, having advised an artist on a nearly identical contract (whose template is it, anyway?) sans SUV and flat. The label lawyer rejected virtually all the changes requested, so the artist was advised not to sign. Artist signed anyway. Ask the average Nigerian artist where they expect their money to come from and you’re likely to hear live performances and product endorsements. Maybe caller ringback tunes as well. Virtually no one is interested in record sales. This Nigerian model is predicated on music being given away for free in the expectation that fame (and then the live performances and endorsements) will follow. This model probably only works for the Top 20-30 artists in my estimation and I don’t believe it to be sustainable. In addition, on CRBTs side, the average artist will get only 6-12% of the gross revenue, depending on the network (those that pay, that is; some are notorious for not paying). Globally though, the highest growth area for music revenue is music streaming, with the IFPI 2016 Global Music Report showing that streaming revenues increased globally by 42.5% on 2015’s numbers. Digital sales on the whole have overtaken physical, the figures now standing at 45% and 39%, respectively. Streaming accounts for nearly half of the global industry’s digital revenues. I might have a slight occupational bias here, but artists as a whole stand to make a lot more if they began to take digital REVENUES (not merely distribution) seriously. COSON continues to do a great job of informing the public in the various rights that music users should respect. They have also done well, as the sole collecting society authorised by the Nigerian Copyright Commission, in collecting license payments from broadcasters and public venues where music is played and enjoyed (hotels, bars, restaurants, etc.). However, this is performance rights revenue, which globally accounts for only 14% of the pie. If the aim, as the representatives of COSON frequently say, is to ensure that producers, session musicians, songwriters, etc. also get a slice, there’s the question to be asked whether or not it’s helpful to join the industry in ignoring sales. A few producers have been in the news recently, accusing artists of not having paid for the work – they have no share in the revenue from the artist’s live performances, so what’s the remedy? There’s also the issue of sampling and covering – ordinarily, there should be a minimum statutory fraction of the sales revenue (from the song doing the sampling or covering) that goes to the original composer. In a jurisdiction where sales aren’t paid attention to, and no statutory rates apply, how do the original rightsholders get compensated? I am aware, I should say, that COSON has a digital licensing framework in the works, and I look forward to its publication in the near future.